While a salient characteristic of the architecture of the late nineteenth century and early twentieth century is its exuberant ornament, there has been a tendency in art historical scholarship to take this ornament for granted, to view it as a product of mere fashionability, or as a constituent of the era’s interest in historical styles. Nowhere, perhaps, is the current framework for understanding architectural ornament of this period more lacking than when it is applied to the highly-ornamented tenements built for the poor and working-class of Boston and New York at the turn of the twentieth century. The ornament on these buildings is difficult to ignore for its prominence, is related - but not beholden - to mainstream trends, and evinces little interest in academic historicism. Finally, these “decorated tenements” confound the usual class-based hierarchy in which elaborately decorative forms are associated with the wealthy and elite. A number of factors make the decorated tenement significant to our understanding of American architecture of this period. First, they were was almost always built by first generation immigrants, usually small-scale entrepreneurs and may represent an important and heretofore-unacknowledged cultural contact zone. Second, they were built in spite of, and quite in opposition to, the Progressive tenement reform movement which was experimenting in ways to eradicate what it considered the scourge of dense multi-family housing outside of paternalistic control. These reformers advocated a ‘gospel’ of strict simplicity for the material culture of the poor and working class, viewing the elaborate forms often chosen by these groups as a sign of bad taste and worse judgment. At the same time, the public image of a tenement, fixed by reform-minded journalists like Jacob Riis, was an old, ramshackle structure, converted from other uses and lacking in many of the most basic provisions for air, light, and comfort. The improvement represented by the decorated tenement frequently went unrecognized, in fact they were often seen as cheap shams, little better than what they replaced. This bias has persisted through a historiography of urban architecture which draws heavily on the writings of these reformers. The decorated tenement, therefore, is a site of contested meaning, embodying questions of taste and propriety, workmanship and honesty, class, ethnicity, and control of the built environment. 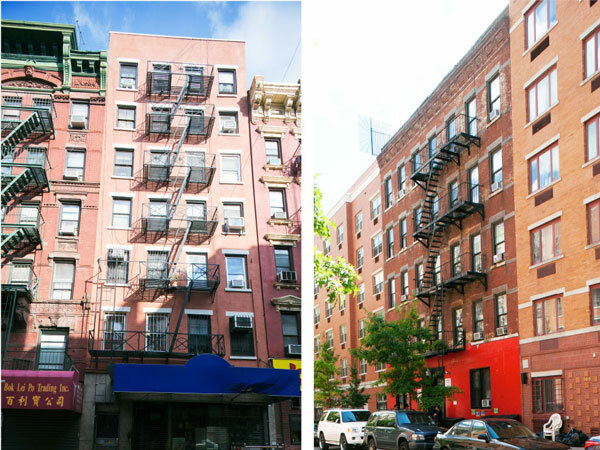 Left: Samuel Weeks tenement, 65 Mott Street, New York, 1824. Architect unknown. Probably the earliest tenement in New York, this building shows the austerity of early tenement construction. (Photo by author, 2011) Right: A.B. Schermhorn Tenement, 302 E. 3rd Street, New York, 1885. George B. Post, Architect. Designed by perhaps best architect in the country at the time, working for the estate of a wealthy family, this building shows the continuation of the austere warehouse-like tenement mode long after ornament was commonly used on tenements. This study will interrogate the role that applied architectural ornament played in the formation of the meaning of these structures for a broad range of people between about 1870 and 1920 including their builders, their occupants, those observers who were disconcerted by the rise of the tenement landscape, and the architectural profession at large - a group of urban strangers, many of whom were struggling to form an American identity. 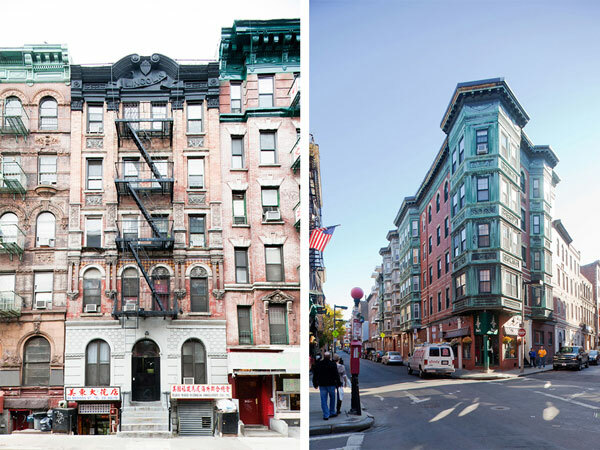 The decorated tenement constitutes an identifiable building type, associated with a particular moment in the history of American urbanization, and one of the more important and dynamic periods in the history of American architecture. Yet these buildings fit uncomfortably into the architectural mainstream of that era; this study seeks to better understand the context and conditions - artistic, ethnic and social - under which they were built. 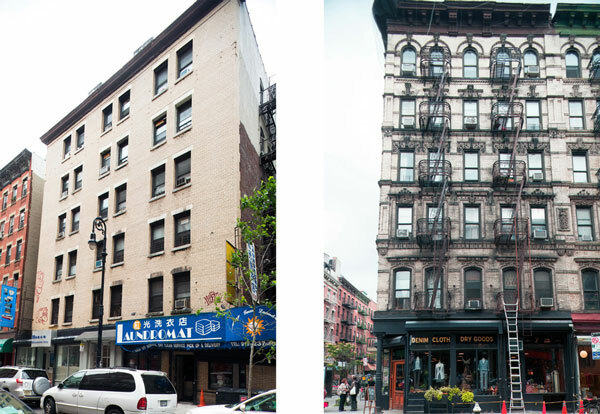 It remains difficult, and, for the most part, unrewarding, to analyze most decorated tenements in terms of their architectural style. Most vaguely correspond to popular academic styles of the moment: the evolution from the Italianate to Eastlake to Queen Anne to Classical Revival is helpful in placing these structures chronologically, may provide little insight into anything else. The differences between these various styles are, indeed, academic. It therefore seems best to analyze the manner in which builders apply ornament, without undue focus on where those forms fit in the chronology of historical styles. Otherwise it is easy to fall into the trap of suggesting these buildings are insipid interpretations of elite architectural styles, created through the use of sham architectural materials, as has been commonly suggested. Instead they represent a distinct and deliberate vocabulary developed by a group of economically ascendant entrepreneurs who were making their mark on the built environment of neighborhoods long controlled by others. If we set aside, therefore, the question of style, we are left with the questions of purpose and meaning. How did builders create a grammar and syntax of ornamental forms to give their buildings a sense of propriety, stability, cultural continuity, playfulness, luxuriousness and so on? Related to this, but perhaps most illusive, is the question to what extent did the architects and builders of the decorated tenement understand the historical and cultural significance of those forms? Their choice to ornament was deliberate and meaningful, but did their choice of specific forms also have meaning? What, if any, role these forms played in the complicated negotiation of identity in this period? These are the central questions posed by this study. While there has been a fair amount of interest in tenement housing in the historical and architectural historical scholarship of the last thirty years, the primary focus of much of this work is on the housing reform movement or of the numerous experiments in model housing for the poor, reproducing, intentionally or not, many of the biases of those involved in that movement. Additionally, what little work has been done on the architectural ornament of this period - outside of the preoccupations of elite architects - usually focuses more on the new industrial methods by which it was produced than on the forms it took and the meanings it held. This study proposes that a more rigorous examination of the facades actual buildings, as well as the documents surrounding their construction, would help to correct the historical interpretation of the tenement and the tenement builders and provide new insight into the way ornament was understood in this period. Because of the relative scarcity of documentary sources to help answer the questions posed by this study, research methodology focused relies heavily on analysis of surviving buildings and primary research. Most importantly, this study will use field work techniques to document, systematize and analyze the ornamental schemes of a large number of tenements in the core immigrant neighborhoods of Boston and New York. It will examine the ways in which ornament was used, how it evolved over time, and what its potential sources were. This fieldwork study be supplemented by primary research to reconstruct, to the extent possible, the nature of the construction of these buildings, and to identify and classify those involved in their construction — owners, architects, builders, and tenants. Finally, this project will also attempt to collect and catalog as many references to the construction and ornamentation of tenements from as diverse a range of period sources as possible. These include prescriptive and reform literature, popular fiction, real estate guides, guidebooks, builders magazines, and other such sources. This is not to say, however, that such references will become the focus of the study. Unlike many other works on tenement architecture, the primary source for this study will be the buildings themselves, and not the much more selective voice of what has been written about them.